NEW YORK The city's limit on the size of sugary drinks is an "extraordinary infringement" on consumer choice, a lawyer for the American Beverage Association and other critics said in court on Wednesday. "New Yorkers do not want to be told what to drink," attorney James Brandt told Manhattan state Supreme Court Justice Milton Tingling. The city Health Department's chief lawyer, Thomas Merrill, told the judge that the limit is reasonable and needed, and the health board had the authority to enact it. "The reason for the rule is that there is an obesity epidemic," and scientific evidence show sugary drinks are playing a big role, he said. "A product that contains empty calories and no nutritional value is being over-consumed." Opponents also are raising questions of racial fairness alongside other complaints as the novel restriction faces a court test. The NAACP's New York state branch and the Hispanic Federation have joined beverage makers and sellers in trying to stop the rule from taking effect March 12. Critics are attacking what they call an inconsistent and undemocratic regulation, while city officials and health experts defend it as a pioneering and proper move to fight obesity. The issue is complex for the minority advocates, especially given that obesity rates are higher than average among blacks and Hispanics, according to the federal Centers for Disease Control and Prevention. The groups say in court papers they're concerned about the discrepancy, but the soda rule will unduly harm minority businesses and "freedom of choice in low-income communities." 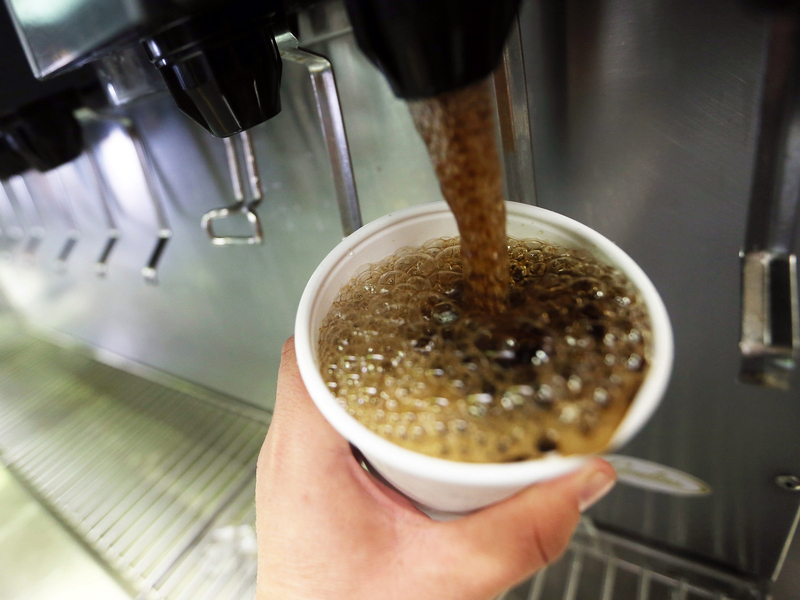 The latest in a line of healthy-eating initiatives during Mayor Michael Bloomberg's administration, the beverage rule bars restaurants and many other eateries from selling high-sugar drinks in cups or containers bigger than 16 ounces. Violations could bring $200 fines; the city doesn't plan to start imposing those until June. "If government's purpose isn't to improve the health and longevity of its citizens, I don't know what its purpose is," Bloomberg told "CBS This Morning" co-host Charlie Rose last June. "We're not here to tell anybody what to do, but we certainly have an obligation to tell them what's the best science and best medicine says is in their interests." The city Board of Health approved the measure in September. Officials cited the city's rising obesity rate  about 24 percent of adults, up from 18 percent in 2002  and pointed to studies linking sugary drinks to weight gain. Care for obesity-related illnesses costs more than $4.7 billion a year citywide, with government programs paying about 60 percent of that, according to city Health Commissioner Dr. Thomas Farley. "It would be irresponsible for (the health board) not to act in the face of an epidemic of this proportion," the city says in court papers. The National Association of Local Boards of Health and several public health scholars have backed the city's position in filings of their own. Opponents portray the regulation as government nagging that turns sugary drinks into a scapegoat when many factors are at play in the nation's growing girth. The American Beverage Association and other groups, including movie theater owners and Korean grocers, sued. They argue that the first-of-its-kind restriction should have gone before the elected City Council instead of being approved by the Bloomberg-appointed health board. Five City Council members echo that view in a court filing, saying the Council is "the proper forum for balancing the city's myriad interests in matters of public health." The Bloomberg administration counters that the health board, made up of doctors and other health professionals, has the "specialized expertise" needed to make the call on limiting cola sizes. The lawsuit also argues the rule is too narrow to be fair. Alcohol, unsweetened juice and milk-based drinks are excluded, as are supermarkets and many convenience stores  including 7-Eleven, home of the Big Gulp  that aren't subject to city health regulations. The NAACP and the Hispanic Federation, a network of 100 northeastern groups, say minority-owned delis and corner stores will end up at a disadvantage compared to grocery chains. "This sweeping regulation will no doubt burden and disproportionally impact minority-owned businesses at a time when these businesses can least afford it," they said in court papers. They say the city should focus instead on increasing physical education in schools. During Bloomberg's 11-year tenure, the city also has made chain restaurants post calorie counts on their menus and barred artificial trans fats in french fries and other restaurant food. In general, state and local governments have considerable authority to enact laws intended to protect people's health and safety, but it remains to be seen how a court will view a portion-size restriction, said Neal Fortin, director, Institute for Food Laws and Regulations at Michigan State University.